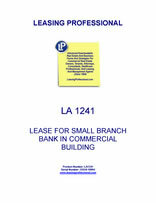 This lease is designed for a small branch bank that occupies space in a small commercial building. The banking tenant's employees and customers have the right to use designated parking areas on a nonexclusive basis. This Lease is made as of _________________, by and between COMMERCIAL PROPERTY LANDLORD, INC., a __________________ corporation ("Landlord"), and AGREEABLE BANK TENANT, INC., a _________________ corporation ("Tenant"). This section sets forth certain basic terms of this Lease; however, the other Articles of this Lease contain a considerable number of adjustments and exceptions which qualify the provisions of this Article. 1.2 Premises. Shown on floor plan attached as Exhibit "A". 1.5 Area of Premises. _____ Rentable square feet. 1.6 Initial Monthly Rental. $_______ payable on the first day of each month. 1.7 Tenant's Percentage of Building. 1.13 Use of Premises. Branch Bank. 1.14 Landlord's tenant improvements are to be determined. 2.1 PREMISES. Landlord hereby leases to Tenant and Tenant hereby leases from Landlord the Premises described in Section 1.1 and 1.2 and delineated on Exhibit "A" attached hereto and incorporated by reference herein. 2.2 PARKING. Landlord shall permit Tenant, its employees and its customers to park in the nonexclusive ________________ parking area. 2.3 COMMON AREAS. Tenant shall have the nonexclusive right, in common with others, to the use of common entrances, elevators, drives, stairs, and similar access, service ways and common areas in and adjacent to the Building. Landlord may exclude any portion of the Building from the common areas provided such exclusion does not materially affect Tenant's access to the premises or parking. 3.1 TERM. The term of this Lease shall he for the term set forth in Section 1.9, or as otherwise established in letter agreement between the parties, and ending on the Expiration Date set forth in Section 1.10 unless sooner terminated as provided in this lease. In the event that Tenant is not granted possession at the commencement Date, the term of this lease shall not commence and the rent and the payment for expenses which Tenant is obligated to pay shall not commence until the Premises are available for occupancy by Tenant. In the event that the delay is due to failure of Tenant to timely provide Landlord with plans, specifications, information, approvals, consents, or the like as required hereunder, the rent shall commence to accrue on the date possession of the Premises would have been delivered to Tenant but for the delays and/or failure of Tenant. If Landlord tenders possession of the Premises to Tenant prior to the Commencement Date and if Tenant elects to accept such prior tender, the term of this Lease shall commence on the date Tenant elects possession of the Premises and all of the terms, covenants and conditions of this Lease, including the payment of rent unless otherwise agreed upon, and other expenses, shall be effective as of such date. Notwithstanding the fact that the term of this Lease commences earlier or later than the Commencement Date, the term of this Lease shall end on the Expiration Date set forth in Section 1.10. 3.2 ACCEPTANCE OF PREMISES. Tenant acknowledges neither Landlord nor any agent of Landlord has made any representation or warranty concerning the Premises or Building with respect to the suitability of either for the conduct of Tenant's business. By taking possession of the Premises, Tenant accepts the Premises in its "as is" condition and acknowledges that the Premises are in good and satisfactory condition at the time of possession except as may be otherwise described as follows: Landlord will clean carpets, wash the windows and touch up the exterior paint. In addition, the Landlord has agreed to permit the Tenant to do interior improvements, such as painting, lighting, electrical and sundry improvements necessary to occupy the space. The Landlord has agreed to give the Tenant full credit against lease payments for all expenditures used to improve the interior space of the premises after Landlord approval of expense. 3.3 QUIET POSSESSION. Upon Tenant paying the rent reserved hereunder and observing and performing all of the covenants, conditions and provisions on Tenant's part to be observed and performed hereunder, Tenant shall have quiet possession of the Premises for the entire term hereof, subject to all the provisions of this Lease. 3.4 SECURITY DEPOSIT. The Landlord has waived any and all security deposits on said premises. The Tenant, however, will compensate Landlord for any loss or damage which Landlord may suffer by the reason of Tenant's default. Any damages that the Tenant inflicts on the premises that is beyond the normal wear and tear must be corrected or repaired prior to abandonment of the premises by the Tenant. Furthermore, any installation of equipment by the Tenant that is subsequently removed must be repaired by the Tenant if damage is created by the removal of the equipment. 4.1 PAYMENT OF RENT. Tenant agrees to pay Landlord the monthly rental or the first day of each calendar month during the term of this Lease as rent for the Premises for such month. If the term of this Lease commences other than on the first day of the month or ends other than on the last day of a month, the rent for a partial month shall be prorated based on the number of days in such month as this Lease is in effect. In addition to said Monthly Rental, Tenant agrees to pay the amount of the rental adjustments as set forth in Section 4.2. Said rental shall be paid to Landlord, without deduction or offset in lawful money of the United States of America, which shall be legal tender at the time of payment, to the address designated by Landlord. All amounts of money payable by Tenant to Landlord hereunder, if not paid by the 10th of each month, the Tenant will be assessed a 5% late fee. 4.2 MONTHLY RENTAL. The Monthly Rental for the calendar year from the Commencement Date shall be the Initial Monthly Rental as provided in Section 1.6. Tenant agrees that after the 30th month and for the succeeding 30 months of the Lease the rental shall be increased over the prior months rental by an amount equal to 3%. The increased amount, if any, will be paid in monthly installments payable on the first day of each and every calendar month during the following month in lawful money of the United States which Tenant agrees to pay Landlord without deductions or offsets. This payment is in addition to amounts provided to be paid under other sections of this Lease. 4.3 EFFECT OF TENANT CLOSURE. Notwithstanding anything in this Lease to the contrary, in the event of a Bank closure all laws pertaining to this Lease will be under the scrutiny of the ______________ State Banking Department or its successor and the Federal Deposit Insurance Corporation's rulings concerning bank closures.